A chart which seems to have been sold as a souvenir at the Halifax Citadel, published by R & J Wetmore, a lithographer in the 1800s in Halifax, Nova Scotia. 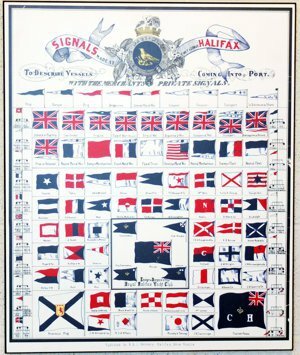 The Wetmores are documented as being in business in 1871, so it's not unlikely that they printed this chart before the Nova Scotia arms changed (or because of it). A blue ensign with a square canton, bearing in the centre what on this chart is the representation of a crown, and in the lower half, each about centred in a quarter, white capital letters "C" and "H". I'm not sure how wide the range for this flag would have been. It could be Halifax, Nova Scotia, North America, Colonies. I would expect a custom house in the UK to have a portcullis, but I may be off regarding the time or the precise nature of a custom house. As we all know, I can't draw recognisable crowns, so I'll have to leave this one for someone who can. A white flag with a blue saltire: Nova Scotia without the arms, or Scotia Antiqua (or whatever that would be in Latin; I would say "Caledonia", rather than "Scotia", so what do I know,) inverted. Divided per saltire white over blue. Again, a saltire in blue and white, with possible (New) Scotland associations. A white flag with a red ball, of half the length of the hoist in diameter. The disk isn't quite centred, but 1/12th of the length of the hoist offset towards the top-edge of the flag, and the same mm. towards the hoist. Though the poster depicts the flag sinister hoist, I have depicted it dexter hoist, on the assumption that the sides are mirror-images. Whether the off-set is in fact significant, I don't know. Schr Sir John Moore, May, from Plaister Cove for Halifax has been wrecked at Cape Canso. The cargo is being saved. Telegram to McLean, Campbell & Co."
Friday, Feb. 2. -- Leander Miller, for being drunk and refusing to quit the police station when requested to do so, fined $1; John Seymore, a Chinese, for stealing a quantity of tobacco from Messrs. Bauld & Gibson, sentenced to 30 days in the city prison." White before very dark blue. The firm can be dated back to at least 1816, but the name "Black Brothers & Co." was used starting in 1855. After 1871 no actual Brothers Black were part, but the firm continued as a hardware store under that name even into the 20th century. Considering they had a private signal, they must have imported foreign hardware themselves. A white flag with ca. the top 2/7th of the hoist red, tapering to a point at the upper fly, and the lower 2/7th of the fly very dark blue, tapering to a point at the lower hoist. See also a sinister hoist version of this, which is under JM Watson, Great Britain. The drawings are not the same as I drew it dexter hoist, and they differ in nearly all details as well, but it's recognisably the same flag. Red, with the centre 9th white. There are people called "Deblois" and "Markle" in Halifax history, but so far I didn't run into the combination. With that name, we'd know what to expect. We'd be wrong, though, as apparently it's a white broad pennant. The Starrs definitely owned ships in Halifax in the 19th century, and the Journals of the House of Assembly of the Province of New Brunswick name for 1 January 1853 a G.H. Starr, Halifax. My quick search did not result in exactly the right company name, though. A white and blue flag: A white flag width a very dark blue border, approximately an eighth of the length of the hoist in width. - For 1820, Moore's Numismatic lists a Nova Scotia one dollar coin from John Albro & Co., hardware merchant, Halifax. http://www.moorecoins.com/JOHN-ALBRO-CO-HARDWARE-MERCHANT-Halifax-N-S-One-Dollar-5-Shillin_i21395010 At the time, merchants would sometimes privately mint coins, which functioned as a form of advertising. Apparently the Albros tended toward enterprises that required additional capital. It makes it difficult to identify exactly this "Albro & Co., though, until we can better determine the date of the chart. Though in the drawing its slightly asymmetrical, I assume this is intended to be three striped of white before red.